Independent creative agency March One has developed a new fundraising event for White Ribbon Australia that turns a social moment into a social movement. 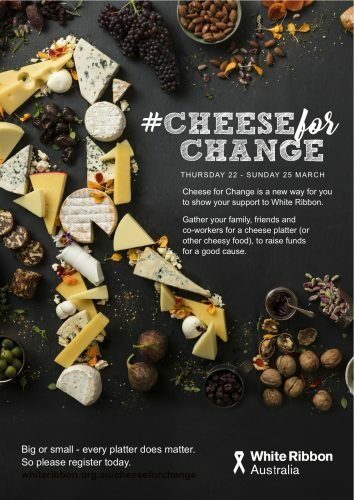 Starting on Thursday 22 March and going until Sunday 25 March, Cheese for Change will ask Aussies to create a cheese platter that matters by gathering friends, family or co-workers together to raise much-needed funds for White Ribbon’s awareness and preventative programs to prevent men’s violence against women. The campaign was developed with content creation driving a genuine connection with everyday Australians. It will feature across social channels with supporting video and bespoke content offering professional advice from food stylists, photographers, and event fundraisers to help Australians make cheese platters that matter. “The strategy is simple and clear for this event: combine an existing activity that people do with a great cause. And let’s face it – everyone loves cheese. March One co-owner and managing director said the agency was incredibly excited about the potential of Cheese for Change, as it is such a simple idea. “When people gather around a cheese platter, conversation just naturally flows, so to be able to guide part of the conversation around such an important issue and to help raise funds is a great opportunity for groups small and large to get involved,” he said. Eliza Arrowsmith, marketing and communication manager at White Ribbon Australia, said: “From the initial presentation from March One right through to the delivery of this campaign, it’s been great to work with a team that have the passion, energy and can-do attitude to bring this to life.